People use bug detectors to identify and locate hidden cameras and covert microphones. They can help you determine if you are being spied upon in your home, office, or anywhere else. When George Orwell wrote "1984," it was a futuristic story, and we had all hoped that "life" would never be like that! However, we are now living in a more Orwellian society, and "Big Brother," almost exists. Everywhere we go, someone is watching us on a camera, whether it's to buy gas at a convenience store, deposit our paychecks at the bank, when we're in a grocery store to buy our "frozen banana guacamole," or even at Mickey-Dees to get a "burger," regardless of what it's made of. Sometimes, since the technology has become so advanced and so affordable, there are hidden cameras and hidden microphones in places where they should not be, or at least we "think and feel" that they should not. Our bug detectors act as sweepers. You turn them on and walk through a room. If any frequencies are detected, it will notify you. 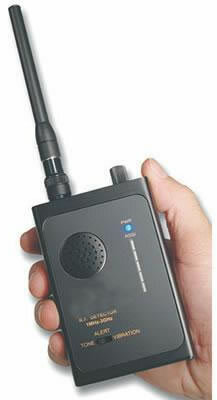 They are also radio frequency (RF) scanners as well. They will detect anything putting off RF energy. When searching your home or office for bugs be sure to search everywhere. They come in many shapes and sizes some being smaller than a penny.